Prepare your reflexes to Polycrom! An arcade puzzle game totally different from what you've played so far. Spin the roulette polygonal finger and fits all colors! FEATURES ★ ideal for improving your skills and reflexes game. ★ You have 3 lives. ★ Difficulty ascendancy. ★ Soothing music. Studies say that colors affect us in a very important way, so indulge yourself in this explosion of sensations and have a good time spinning roulette Polycrom geometric, balls will fall and bounce on the level, as if a pinball were fits the colors and get the highest score. 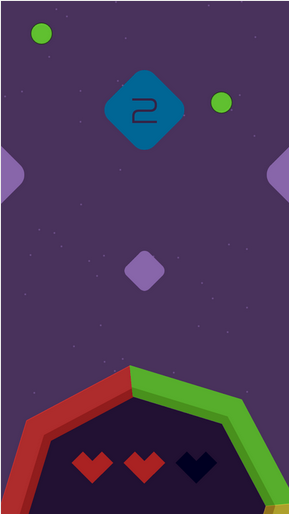 HOW TO PLAY Input, may seem a pinball, but nothing is further from reality, play Polycrom is very easy, you will have a polygonal wheel with 4 colors: green, magenta, red and yellow have to rotate it. Place your finger on the wheel and drag to move it. 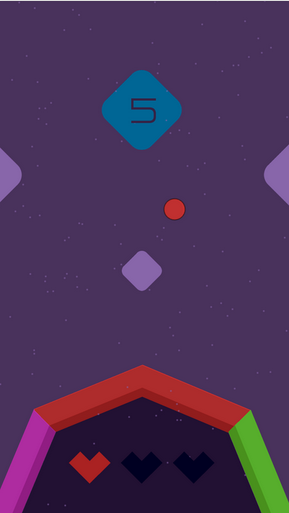 You'll have to have good reflexes in this game and spin the roulette of colors to match the balls that fall from above.